The St. Louis Women's Hope Chorale. "Hope" was recently added to the organization's title, standing for harmony, optimism, philanthropy and empowerment. 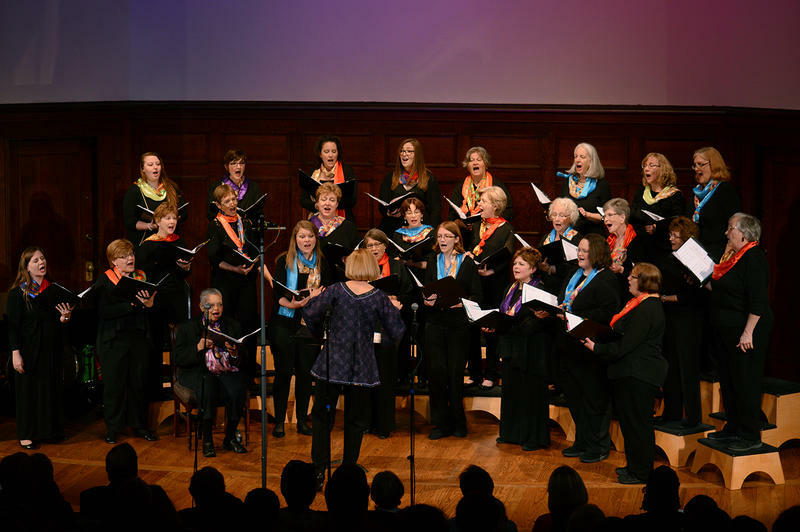 Latuda is the conductor and artistic director of the St. Louis Women’s Hope Chorale, an organization which tackles difficult social justice topics in their concerts regularly. Composer and The 442s’ pianist Adam Maness had previously expressed interest in such a topic after being approached by the grandson of a Chorale board member. And so, “Theater of HOPE” was born…except, not exactly. While Maness had ideas for general shapes of each movement and ideas for spots to emphasize, he was missing a critical element of chorale music: the lyrics. Listen to Adam Maness, Katy Miller and Leanne Magnuson Latuda discuss the creation of "Theater of HOPE" on Friday's "Cityscape." Katy Miller is a therapist who formerly worked in hospice. She uses poetry in her therapy and is a poet herself. This was her first experience writing poetry to be set to music. The end result? A four-movement chorale ode to honor the sacrifice of soldiers and families, and bring attention to the myriad issues each face away, at home and upon return. The piece blends poetry, minimalism, American folk and even gospel styles. Latuda continued, saying that the second movement, “Theater of the Night,” is magical. This movement was influenced by a close family friend of Miller’s who had served in the Gulf War and sent her in-depth reflections and thoughts about his service. The third movement comes from a mother’s perspective, questioning if her child is safe and if and when they come home, who will they be? This movement transitions into the fourth, which comes from the soldiers’ point of view. One of the driving forces behind this piece is to get society behind our veterans too, no matter what your political view. When: Fri., Oct. 16 at 7:00 p.m.